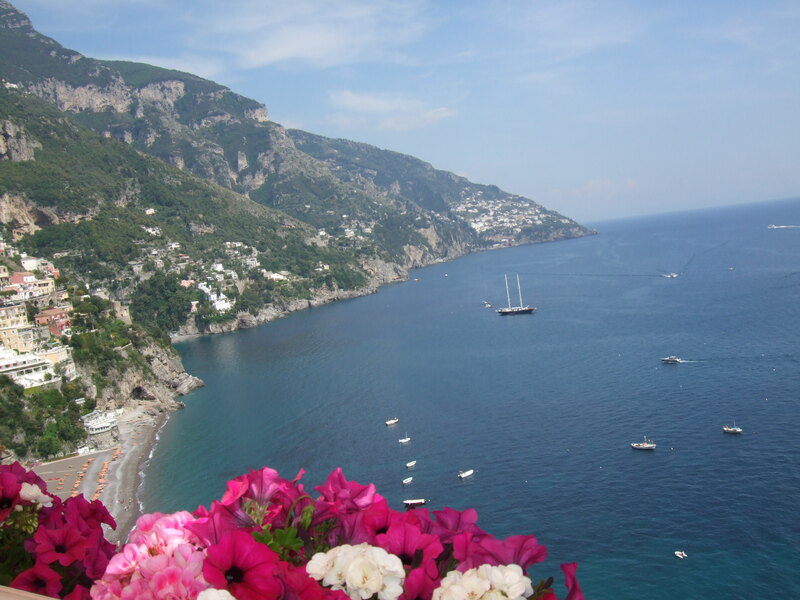 I can’t remember exactly when it became a dream of mine to go to Italy, but it seems like it was a long time ago. It might have been when I studied the country in grade school. Listening to my teacher talk about the David, The Birth of Venus, and other exquisite masterworks, learning about their culture, history, landscapes, art and food. After years of gazing at pictures of the Amalfi Coast, Rome, and Florence, my husband Hanes and I finally got to go in May of this year! Right before one of those “We’re in ITALY!” exclamations. I ate as much as I possibly could. I soaked in the ancient sites. I contemplated the art. I breathed in the air eagerly, and really paid attention to the way the sun felt on my shoulders. It was Italian sun. I couldn’t waste it. At least 50 times per day I proclaimed “We are in ITALY!” as if Hanes didn’t know or couldn’t fully appreciate it unless I stated it emphatically, over and over. I knew the food would be incredible. But until I experienced its freshness, its fullness, and its flavor, I couldn’t have imagined. It made me want to blow everything a kiss. The waiter confirmed: ‘right, no cheese,’ but he highly recommended the one with the pork. I said, “no, sono vegetariana,” and suddenly, you could see the dawn of understanding coming across his face….. No cheese?…. No meat? Happily, our concerned waiter had no need to worry as we found PLENTY of vegan food to eat and enjoy in Italy, as you will see. Everything was so fresh, simple, and delicious there! It wasn’t difficult to navigate menus with the help of English-speaking waiters in the larger cities, and having mastered just a few of those phrases mentioned above for everywhere else, we got by just fine. Did we accidentally consume something that had an animal product in it? Most likely. But for me, the point of being vegan isn’t being pure. The point of being vegan, for me, is reducing the most amount of animal suffering that I possibly can, and I’m happy we were able to do that over in Italia! 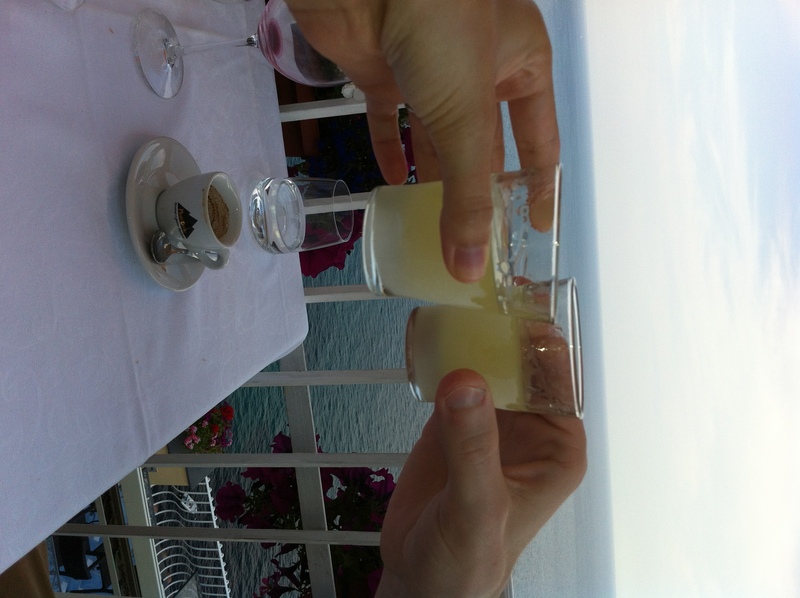 Below are pictures from the first parts of our trip, in Positano and Naples. 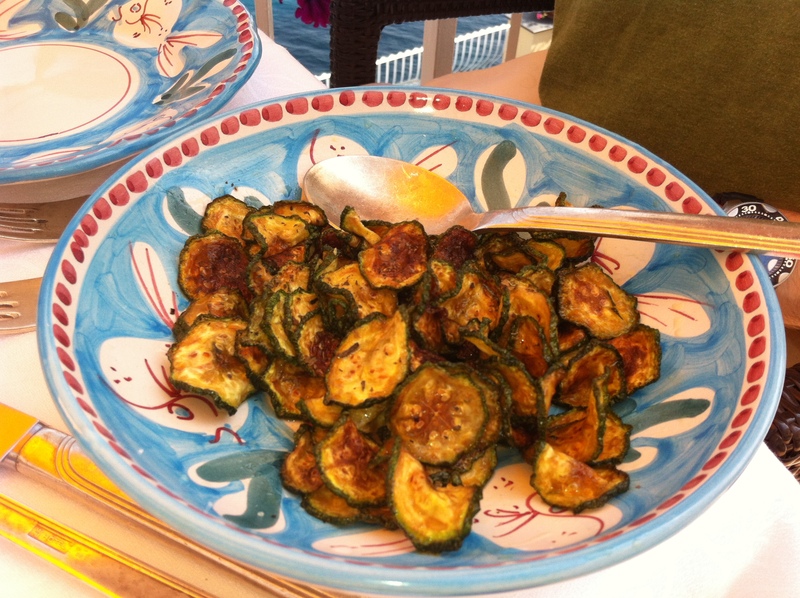 AMAZING pan fried zucchini, so thinly sliced, with vinegar and mint. This was so unexpected and simple, and is an Amalfi Coast specialty. We took our time eating lunch at Il Capitano. Took our time as in three hours. The view was incredible. Looking out over the Mediterranean Sea, sparkling, from this vertical town was so surreal. 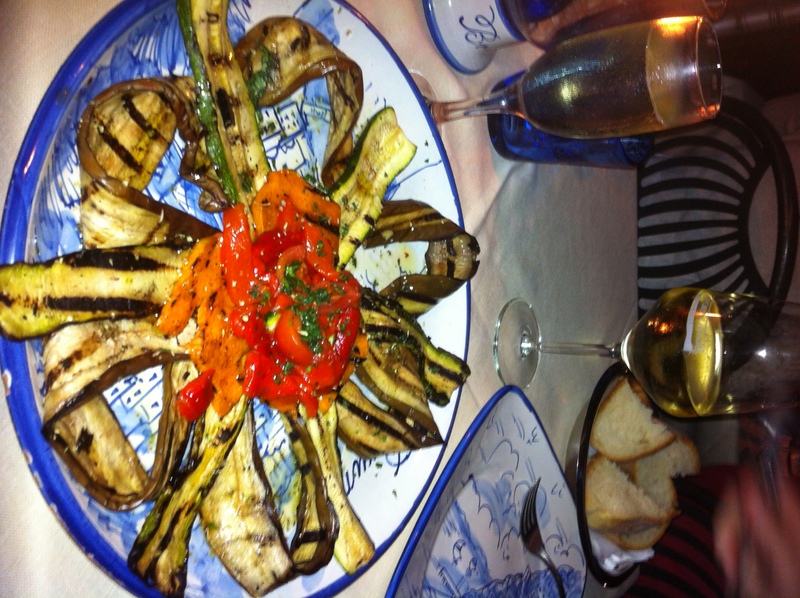 Look at how pretty they made this grilled veggies appetizer at Ristorante di Bruno in Positano! 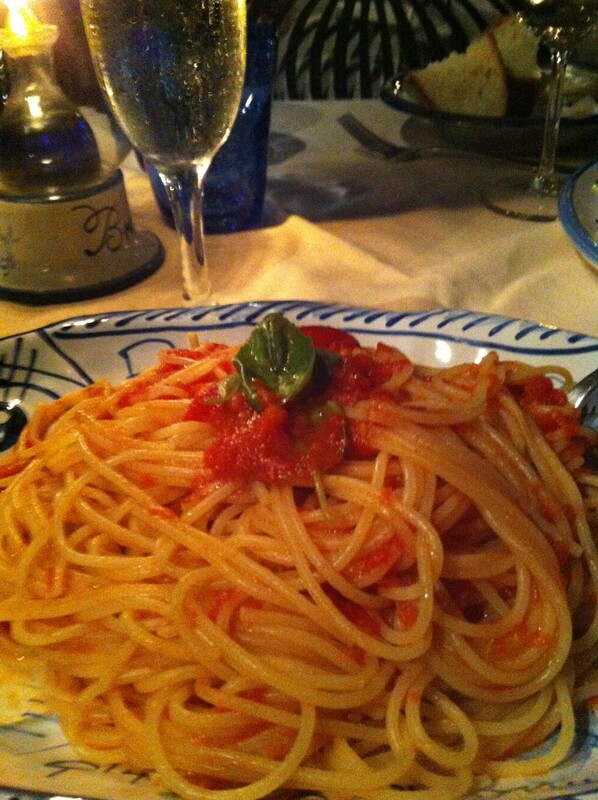 Spaghetti pomodoro at Ristorante di Bruno in Positano. The picture cannot convey how fresh and perfectly herbed this sauce was. Every bite was a delight. 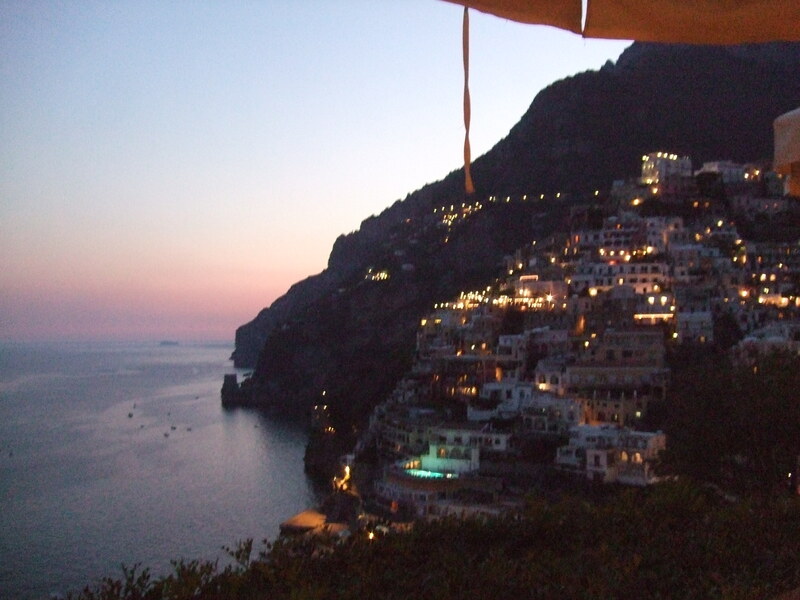 The view of Positano from Di Bruno. Breathtaking. 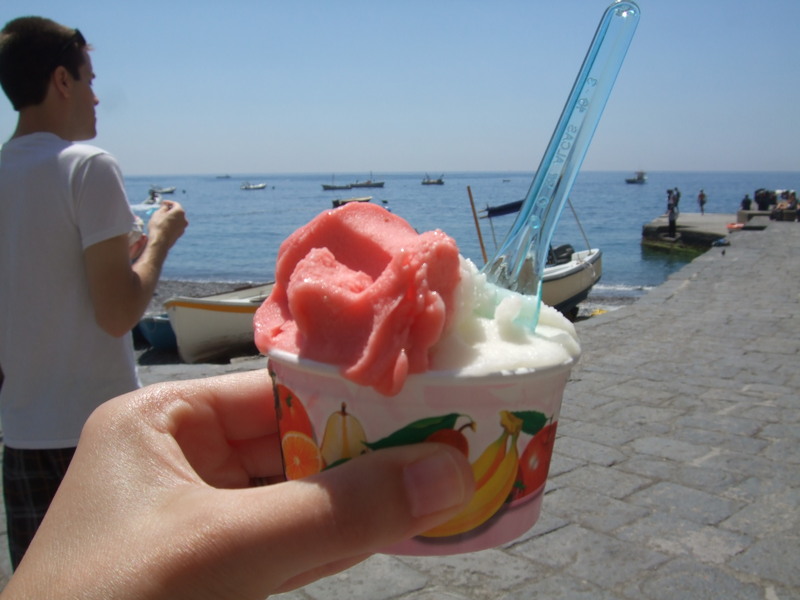 Strawberry and lemon sorbet in Positano, strolling next to the Mediterranean. The MEDITERRANEAN! …Sorry, can’t help it. 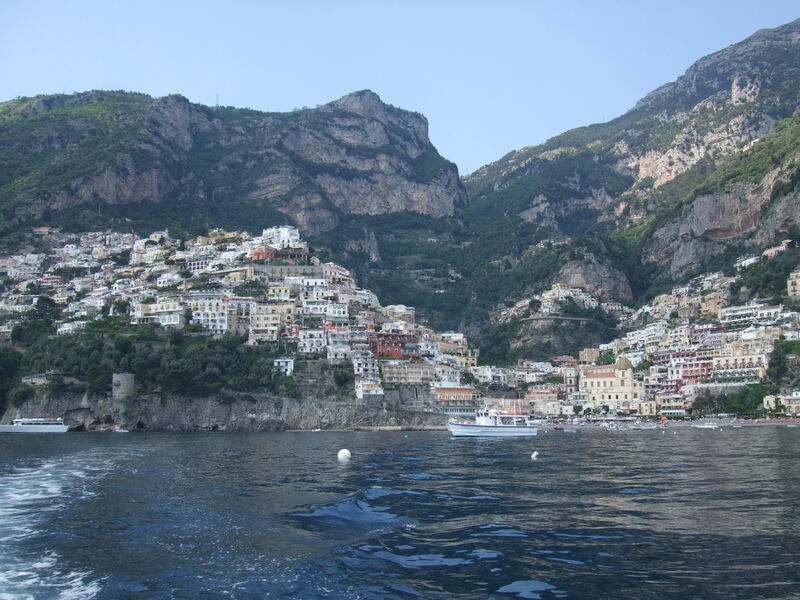 We rented a boat right after the gelato and had a great time seeing Positano and other parts of the Amalfi Coast from the sea. 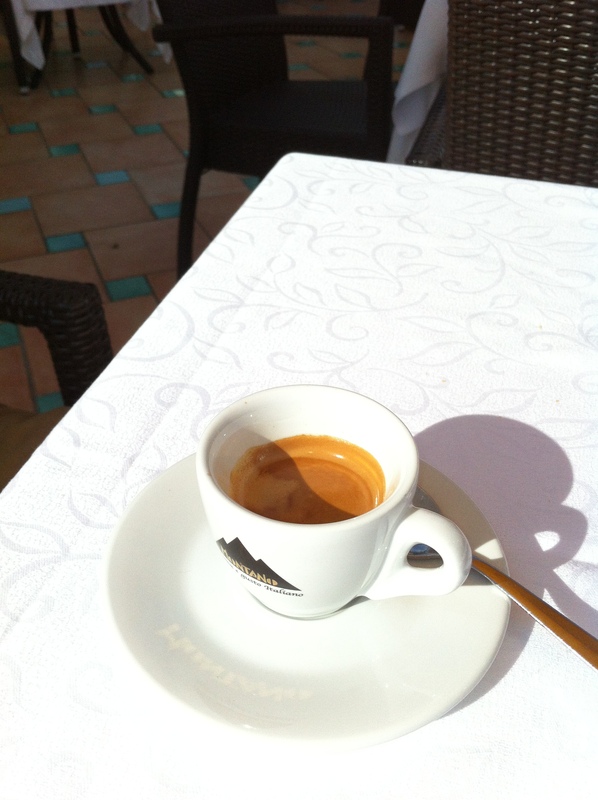 After the boat ride, we got a shot of pre-dinner espresso. Beautiful, wonderful, lovely Italian espresso. Oh how we miss it! This is the bruschetta that we ordered when the waiter cried “MAMMA MIA, what do you eat? 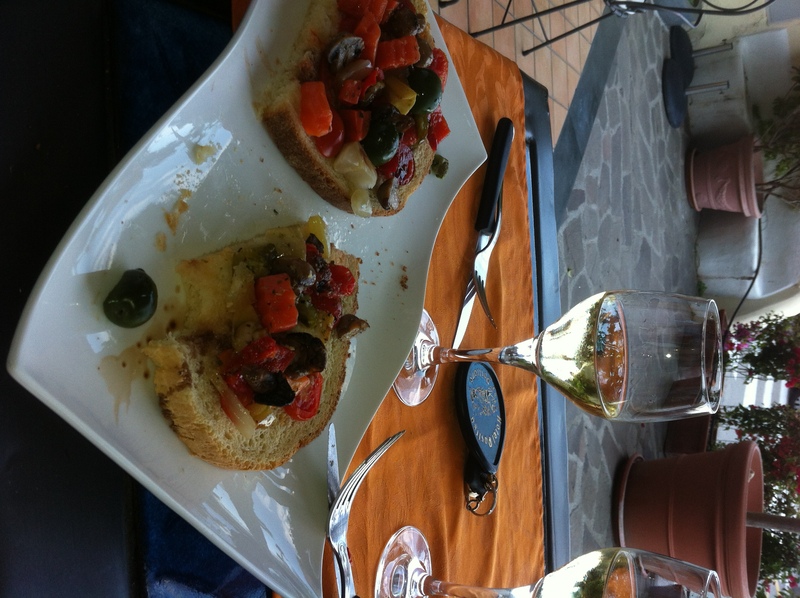 !” Bruschetta brushed with olive oil, and topped with grilled veggies and fresh herbs. Lemoncello of course! In Positano at Il Capitano, our favorite. Except for Di Bruno, also our favorite. Both favorites! Then, it was off to Napoli to catch a train to Rome for the next leg of our trip. 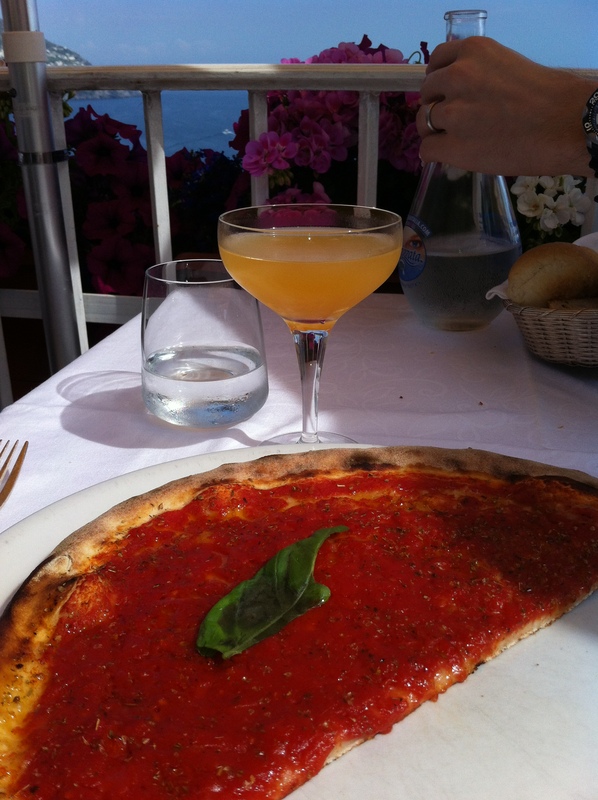 This pizza marinara is the one I had a mini freak out over at La Antica Pizzeria da Michele in Naples (the one featured in ‘Eat, Pray, Love’). This was my FAVORITE thing I ate in Italy, hands down. And maybe my favorite thing ever. 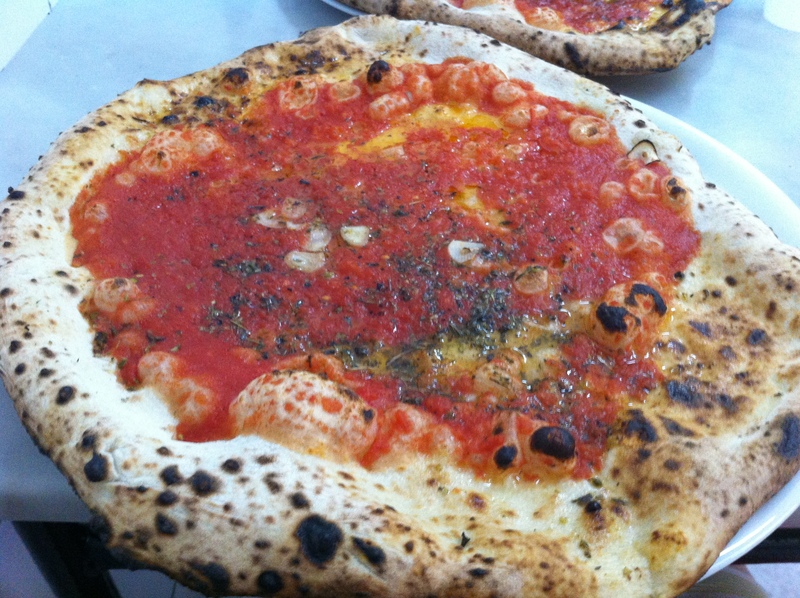 If you ever go to Naples, or are anywhere near Naples, you MUST stop and get pizza here. It would be a crime not to. Rome and the rest of our trip…in a future post – “Vegan in Italy Part II” (and maybe III and IV). It’s a cliffhanger, folks. P.S. 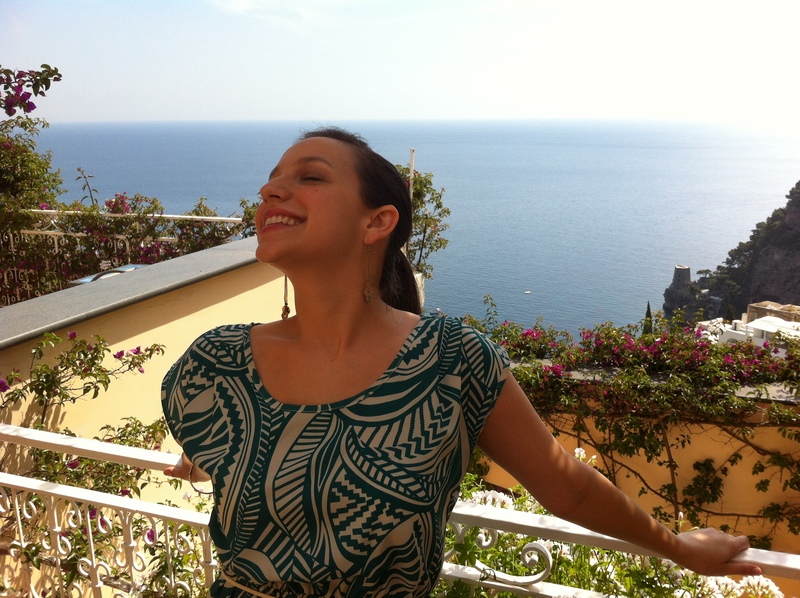 Check out the sequels to this post: “Vegan in Italy, Part II” and “Vegan in Italy, Gran Finale“! So glad you've stopped by my blog where I share what I eat, what I buy, what I wear...WHAT I VEGAN! Vegan does not equal "Picky Eater"
Is Celery All You Can Eat?